In 2014, the Open Innovation team noticed a disparity in the ratio of International Space Apps Challenge participants -- roughly 80% men to 20% women. We embarked on a quest to better understand how to attract more women and girls to data by conducting a year-long study, which included a literature review followed by dozens of interviews with leading women’s organizations in the data, tech, and startup communities. As we dug into the literature, we found the Space Apps ratio reflects national trends. While women in the United States earned 57% of all bachelor’s degrees since the late 1990s, only 18.2% are in the field of computer sciences, according to the 2015 National Science Foundation report on “Women, Minorities, and Persons with Disabilities in Science and Engineering.” A 2016 Intel report, "Decoding Diversity: The Financial and Economic Returns to Diversity in Tech" notes that "for technical roles, female representation falls to 12 percent—far short of the proportion of women working in many other occupations traditionally viewed as male-dominated." In 2013, women only represented 26% of the professional computing workforce, a sharp decrease from 35% in the 1990’s, according to the American Association of University Women “Solving the Equation” study. A 2002 “Women in Computing Around the World” study suggested that the gender gap in STEM and computing is inconsistent across cultures, with the lowest participation rates among women in the US, UK and Australia. And, the gap is widening. A few key takeaways from our research: women are looking for a collaborative, welcoming environment where they can build relationships and engage early with the ideas, concepts, and technology. Women do their homework to determine if an event is worth an investment of their time. They look for signals, such as female speakers, early access, child care, and travel stipends. Based on what we learned, we created two new initiatives to signal a welcome environment for women: Space Apps Data Bootcamp, as a one-day pre-event to get introduced to data and code before the annual hackathon; and NASA Datanauts, as a year-round engagement to learn and practice data science skills. The all-female 2015 Founding Class of Datanauts, served two important functions -- to signal NASA is a welcome environment, and to help us understand their communities and how to design data engagements that attract more women and newcomers to NASA data and the new field of data science. Our second class of Datanauts will serve as beta-testers for the data engagements we designed over the last year. We created a collaborative environment to enable the new cohort to work together, share ideas and skills, and hopefully learn and hone new capabilities as they solve monthly data challenges and host data engagements within their communities. We have 16 beginning coders, 26 intermediate, and 7 advanced. We asked the Datanauts to self-sort themselves in skills categories. The breakdown is as follows: 2 designer/artists, 16 developers, 5 entrepreneurs, 1 game designer, 6 storytellers, 9 students, 7 subject matter experts, and 2 miscellaneous. And now...drum roll...meet the 2016 Class of NASA Datanauts (listed in alphabetical order! Maham Aftab is pursuing a PhD in optical sciences and works as a research assistant with a large optics fabrication & testing group. She studied engineering and hold masters degrees in applied physics and optics, matter & plasma. Analisa Balares is CEO and Chief Innovation Officer of Womensphere which brings together women and girls for a Global Codefest, Artfest and Videofest, and offers an Incubator Network and Academy. Their goal: train and educate 1 billion women and girls by 2030. Lisa Ballard is CTO of Spacehack.org; co-creator of Spaceprob.es, a catalog of active robotic space missions; and web developer for SETI Institute Planetary Data System Rings node. Her passion, other than space, is design, collaboration, and beautiful user experiences. Emily Barry loves to tell stories about people with data and is especially interested in interactive data visualizations. She currently is a Data Science fellow with Metis in San Francisco. Lexi Basantis is a mechanical engineering student and co-founder of Think Like a Girl which empowers girls to become the next gen problem solvers. Kerry Benjamin is passionate about STEAM and a big fan of intersections such as between tech, art, business, and sciences. He'd love to make an impact in the broad field of data science. Simon Berman taught himself to code, and has built AR and MEAN stack apps while completing a masters degree in computer science. He also created art installations, has a fine arts degree and has worked as a film and TV editor. Tracey Birch has 25 years of experience in software development and system administration. She is a mom of three, and lives to teach, learn, and explore with her kids -- from Shakesphere to citizen science. Amanda Casari focuses on data science and computational storytelling. She works to foster an inclusive community in the Seattle data community through participation in Ada Academy, Seattle Spark Meetup, PyLadies and Women Who Code. Alexis Chan is a software engineer who creates scientific visualization and virtual reality. She's interested in machine learning and data analytics. Loretta Cheeks devotion to advancing technology, STEM K-12 outreach, and disability and women’s advocacy has been the driving force behind her passion for pursuing a PhD. She studies engineering and computer science. Ruby Childs is a data scientist who loves textile and geometrical designing. She is also a PyData LDN and H&&T LDN organizer. Nadia Chilmonik is a Brooklyn-based artist and engineer (and former ballerina) who is interested in space programs, data science, and predictive models. She has expertise in optimization algorithms, and works at Thicket Labs on collaborative intelligence. Cindy Chin is an entrepreneur and venture strategist with over 20 years experience in research, operations and strategy with technology companies, telecoms, pharmaceuticals, asset management firms and non-profit foundations. Siobahn Day is a researcher at the Center for Advanced Studies in Identity Science at North Carolina A&T State University. She is PhD student in computer science with interests in data science, identity science, artificial intelligence, and machine learning. Dr. Noemi Derzsy works in network science, studying complex systems with underlying network structure. She holds a PhD in physics and loves to explore big data, tackle problems, and apply current computational techniques to answer questions. Katie Erickson is a student who loves learning to code and has always been passionate about space. She plans to combine her interests to create her own independent study major in computational astrophysics. Crystal Franklin works in public and community health, specifically in HIV/AIDS prevention efforts. She is eager to learn new skills and connect with other women who code. Cheyenne Gaima is exploring life through writing and technology. She's eager to grow her knowledge of STEM fields. Caitlin Gallagher is a communications analyst, managing data visualization and analysis for the United States Marine Corps. She believes every data set has a story to tell and it is our job to uncover it. Caitlin is also a figure skating coach. Danielle Gervalis discovered data and coding through engagement with NASA's Space Apps and Datanaut initiatives. She's a civil servant at Veteran's Affairs with extensive experience in project management, human resources, procurement, and financial management; and is determined to conquer her new skill: Ruby on Rails. Aaron Kamholtz is a self-taught programmer who works in People Analytics, where he focuses on data management, data visualization, and storytelling using people data. He enjoys tackling new problems without an expected outcome. Julia Karkowska is a math and computer science student interested in robotics and data science. She loves thinking about geospatial challenges, and topics that combine neuroscience with technology. Jeff Keeton is an environmental scientist, a data scientist-in-training, and passionate about data visualization and data-driven decision making. He has tackled challenges within the environmental, technological, and policy domains, and is excited for what’s next. Claire Kelling studied statistics and data analytics and will pursue her PhD in statistics. Her research centers around gender-based violence on college campuses. Julie Knight is a Java software engineer with over 11 years of experience. She attended the 2016 Space Apps Challenge Data Bootcamp and love reading, puzzles, the outdoors, podcasts about science and storytelling. Karolina Kumiega is the Data and Analytics Manager at Girls Who Code. She is passionate about empowering women and telling compelling stories with data. TIna Lai is a printmaker and web developer, and took part in the 2016 Space Apps and Data Bootcamp. 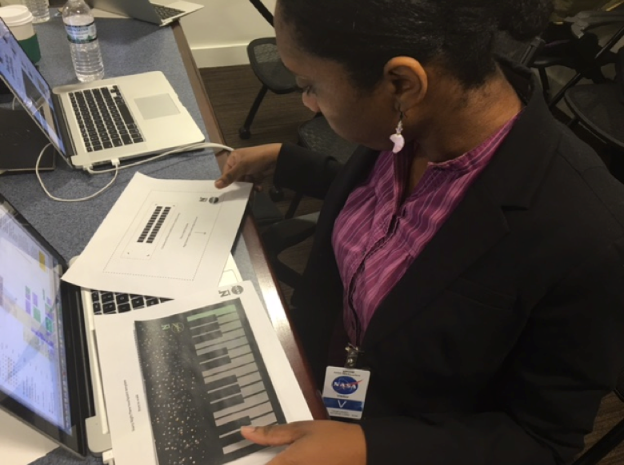 She participated as a Lightning Talker at NASA's White House United State of Women Summit event in Washington DC to share her Space Apps data engagement experience. Zara Leventhal is a student of interactive digital media and combines design and programming. She learned HTML/CSS when she was 7 years old and has continued to code ever since. She's interested in experimental and wearable technology. Ting Li is founder of the creative studio Pixelatoms and has a background in biophysics, cryptography and cybersecurity. She believes in the power of storytelling to articulate discoveries and explorations. Karen Lopez is a Data Architect and Evangelist. Speaker, Trainer, Space Enthusiast; and has attended NASA's Space Shuttle Tweetups, Socials, and Space Apps. She's a pathfinding data geek. Cheney Lyford is majoring in math and computer science. She loves problem-solving with program code and math. Tunisia Mitchell is a self-taught developer, a trained anthropologist and documentarian. She loves blending history and science to create solutions. Rutu Mulkar-Mehta is founder and data scientist at Ticary Solutions, solving problems pertaining to natural language processing and machine learning. She holds a PhD in computer science and runs the NLP Meetup group for the greater Seattle area. Dr. Nannette Napier is a professor of computer literacy and programming and integrates data analysis into her courses. She worked as a software engineer for 8 years before obtaining a PhD in information systems. She works to advance diversity in tech. Chinasa Okolo is completing her degree in computer science, with interests in computational theory, biological anthropology, and bioinformatics. She's dedicated to improving educational access for underrepresented students in STEM. Dr. Julia Pap works in the data mining group at the Institute for Computer Science and Control in Budapest, Hungary. She holds a PhD in discrete mathematics. Christine Phu is a photographer and space enthusiast. She is interested in how design and art can be combined with technology and science and is passionate about solving data challenges. Annette Ponnock works in educational research and data analysis. She is passionate about art and tech-based textile projects, designing original textiles using data patterns, and learning R and Python. Megha Punjani is a software engineer working on routing platforms. She has experience in hardware bringup, device drivers, virtualization and is passionate about getting more girls andwomen in STEM, space and science fiction. Olivia Ross participated as a speaker in NASA's inaugural Data Bootcamp at Space Apps NYC in 2015. She's a game designer and student, creating the art and code for SuperBlock, and iOS game. Victoria Rutledge loves space and responsive web design. She works in advertising for educational companies and aspires to have her own ad agency. Mariam Serag is a storyteller and an explorer. She founded a student organization in her school to help young people explore their potentials, and co-founded a media platform for marginalized Egyptians in Sinai. Dr. Julia Silge is a physicist and astronomer by training. After earning her PhD 10 years ago, she stays busy as a data scientist in the nonprofit world, and as a mom of three kids. Greg Sklar is a startup incubator manager with over 120 environmental and socially sustainable ventures. He is interested in applying his experience in many fields to problem-solving in space. He led a 2016 Space Apps Data Bootcamp Stardust Station on storytelling design. Briana Vecchione is a Civic Tech Fellow at Microsoft and also head of wogrammer. Her background in computer science and math is complemented with interests in physics, philosophy, government, entrepreneurship, and urban planning. Ralitsa Velikova is a computer science student who loves math, algorithms and coding in Go and NodeJS. She is interested in philosophy and has won two prizes at the National Philosophy Olympiads in Bulgaria. Kaira Villanueva is a student majoring in computer science and environmental biology. She is currently researching climate change from pollen grains. We're looking forward to learning from this second class. I'm sure they have much to teach us as we navigate new ways to enable citizens to problem-solve with NASA data. We're in this grand experiment together. Welcome Datanauts 2017 Spring Class!